Betaproteobacteria is a class of Proteobacteria that are all Gram-negative. The Betaproteobacteria consist of several groups of aerobic or facultative bacteria that are often highly versatile in their degradation capacities, but also contain chemolithotrophic genera (e.g., the ammonia-oxidising genus Nitrosomonas) and some phototrophs (members of the genera Rhodocyclus and Rubrivivax). Nitrosomonas is a genus comprising rod shaped chemoautotrophic bacteria. This rare bacteria oxidizes ammonia into nitrite as a metabolic process. Nitrosomonas are useful in treatment of industrial and sewage waste and in the process of bioremediation. They play an important role in the nitrogen cycle by increasing the availability of nitrogen to plants while limiting carbon dioxide fixation. Betaproteobacteria play a role in nitrogen fixation in various types of plants, oxidizing ammonium to produce nitrite- an important chemical for plant function. Many of them are found in environmental samples, such as waste water or soil. Pathogenic species within this class are the Neisseriaceae (gonorrhea and meningitis) and species of the genus Burkholderia. 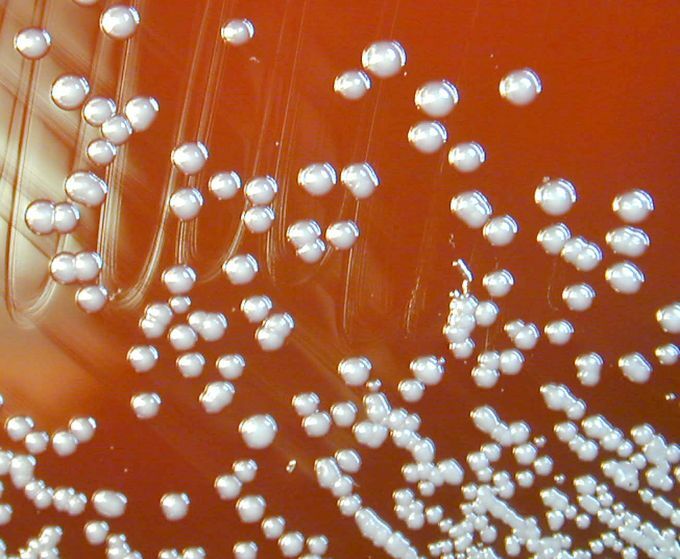 Betaproteobacteria: Burkholderia pseudomallei colonies on a Blood agar plate. Burkholderia is a genus of proteobacteria probably best known for its pathogenic members: Burkholderia mallei, responsible for glanders, a disease that occurs mostly in horses and related animals; Burkholderia pseudomallei, causative agent of melioidosis; and Burkholderia cepacia, an important pathogen of pulmonary infections in people with cystic fibrosis (CF). The Burkholderia (previously part of Pseudomonas) genus name refers to a group of virtually ubiquitous gram-negative, motile, obligately aerobic rod-shaped bacteria including both animal/human (see above) and plant pathogens as well as some environmentally important species. The Betaproteobacteria consist of several groups of aerobic or facultative bacteria that are often highly versatile in their degradation capacities. The Betaproteobacteria contain chemolithotrophic genera (e.g., the ammonia-oxidising genus Nitrosomonas) and some phototrophs (members of the genera Rhodocyclus and Rubrivivax). Betaproteobacteria play a role in nitrogen fixation in various types of plants, oxidizing ammonium to produce nitrite- an important chemical for plant function. Betaproteobacteria: Betaproteobacteria is a class of Proteobacteria. Betaproteobacteria are, like all Proteobacteria, Gram-negative. glanders: An infectious disease of horses, mules and donkeys caused by the bacterium Burkholderia, one species of which may be transmitted to humans. melioidosis: An infectious disease caused by a Gram-negative bacterium, Burkholderia pseudomallei, found in soil and water. It is endemic in Southeast Asia and northern Australia. Symptoms may include pain in chest, bones, or joints; cough; skin infections, lung nodules and pneumonia.